Sunday I finished two chapter books-it thrilled me to finish two in one day! I was a few chapters into eleven by Patricia Reilly Giff, when I received one of those great packages in the padded envelope-it held a copy of Once a witch by Carolyn MacCullough. Of course, I started witch, which then put me in-between in two books. I alternated reading each one and think it only f itting to blog about them at the same time. Once a witch ( Sept, 2009) is suspenseful, exciting and not creepy! I hope Carolyn MacCullough is planning a sequel; I want to know more about Tamsin and Gabriels's story!! As I described it to a friend on the phone-the premise is good because of course, who doesn't want to be a witch, I ask you?! You know, the same reason HP is so popular-ordinary kids doing magic!!! In this one, Tamsin Green comes from a long line of magically talented folk yet she doesn't find her "talent" at the regular age and resents that she is "normal". Tamsin attends boarding school in NYC to keep a little distance between her and her family. During summer break she meets someone who mistakes her for her talented older sister, Rowena. It is this mix-up and her resentment that fools the antagonist (Alistair) into believeing Tamsin will fold against her family. Tamsin's family is unique and believable and I wanted to be one of them! Once a witch kept my interest easily, the characters were wonderful and the story made sense-all important aspects for me! I especially liked Tamsin's relationship with Agatha, her roommate and Gabriel, her long-lost childhood friend. I received this arc from a Picnic Basket request-thank you! Check out the cool Once a witch website where you can find out more, take quizzes (discover which witch you most resemble-yes, I played) and research the Green family tree. Read the synopsis and a quick review from Kirkus review by clicking here. For Carolyn MacCullough's web page click here. I found out this is her fourth book! 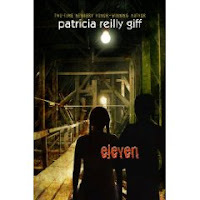 Eleven (2008) by Patricia Reilly Giff is the story of Sam and his grandfather, Mack Mackenzie. Sam, who struggles with reading, begins to have dreams that do not make sense to him. He is drawn to the attic, which holds a lock box with one clipping hanging out. The clipping shows his picture and his name...with a different last name. He cannot read enough of it to make sense and he needs to get the box open. Sam makes friends with Caroline, a good reader at school, who will help him. Together they form a close connection between searching for clues to Sam's life as well as building a castle for a class project on medieval life. Sam is a builder like his grandfather, but he cannot feel comfortable until he solves the mystery of his dreams. This is a great read for 3-5th grade students.